The NanoCenter’s director of the Advanced Imaging and Microscopy (AIM) Laboratory, Dr. Wen-An Chiou, has been chosen as a Fellow of the Microscopy Society of America for 2018 for his contributions to the field of electron microscopy and his work as an educator. WETEM is a microscopy technique that allows scientists to view samples of everything from alloys to zooplankton in their natural state. The inside of the transmission electron microscope is very sensitive to moisture, but drying out a sample can create problems. When a substance loses moisture it can change shape, and scientists can’t observe the natural reactions and processes that would take place if water were present. Chiou created a way to isolate a sample in a separate cell and, crucially, maintain good pressure inside the vacuum chamber of the microscope. Chiou has a long history at the NanoCenter in teaching and mentoring. Dozens of students every year participate in his training on advanced microscopes. 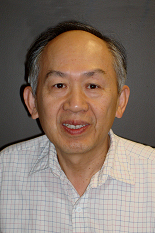 When the NanoCenter opened in 2006, Chiou became the director of the Nanoscale Imaging Spectroscopy & Properties Laboratory, later renamed to the Advanced Imaging and Microscopy Laboratory. Chiou and his staff teach and supervise students, and also provide microscopy services and collaboration to the lab’s users. “Wen-An’s devotion to research is very much complete, and his interactions with the community from societies to vendors is exceptional,” said Dr. Gary Rubloff, the director of the NanoCenter. Before joining the University of Maryland, Chiou was an associate professor and the director of the Materials Characterization lab at Northwestern University. He received his education from the Texas A&M University, coming to the United States in 1973 from Taiwan. Chiou was previously nominated by former MSA president Charles Lyman, and his nomination was updated this year by ORNL microscopist and innovator Lawrence Allard. The selection committee was composed of nine individual MSA members, three each from the biological sciences and the physical sciences, one each from the Education and the Technologists' Forum Committees, and the President-Elect as Committee Chair. Chiou is one of just eight Fellows selected, representing the top half-percent of MSA members. The honor will be conferred on August 6 in Baltimore at the Microscopy & Microanalysis 2018 meeting. Chiou and the other new Fellows will receive a plaque during a plenary session. The Microscopy Society of America said it champions all forms of microscopy and the development of new imaging technologies through its annual meeting, its publications, and its educational outreach.